Benefits of Protein – Why Should You Eat More of it? Home » Portfolios » Benefits of Protein – Why Should You Eat More of it? Most people associate protein with muscles. True, protein is used by the body to build and repair muscle tissue. However, protein is also a key component to other structures within our body. Proteins are also used to manufacture hormones, enzymes, cellular messengers, nucleic acids, and immune-system components. Without adequate protein, our bodies can’t put together the structures that make up every cell, tissue, and organ, nor can it generate the biochemical substances needed for cardiovascular function, muscle contraction, growth, and healing. That all happens within the body at the cellular level. What people really want to know is what are the tangible protein benefits that I will see and notice. 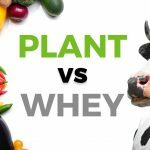 In 2008, The American Journal of Clinical Nutrition published an article proving that protein is more satiating than either fat or carbohydrates. This means that you are likely to feel more full when eating a high protein diet with fewer total calories than foods rich in carbohydrates or fats. In a 2010 study published in Germany at the University of Ulm, subjects who used high-protein meal replacements as part of a low-calorie diet lost more weight and fat mass throughout the course of a year than subjects who did not use the supplements. Protein when paired with exercise can help increase your strength and muscle mass. According to Rice University, adults who want to put on muscle should strength train several times per week and increase their protein intake from 0.4 to 0.6 grams per pound of body weight per day to between 0.6 and 0.9 grams. This was reinforced by a 2015 study published in Sports Med that showed that protein supplements can accelerate gains in both aerobic and anaerobic power. Protein is essential for our brain to produce neurotransmitters such as serotonin, which is the main way that our body regulates our mood, and dopamine. As a result, eating more protein helps to boost our levels of serotonin and dopamine and this helps to boost energy & mental clarity. The result is that you feel happier, better able to regulate pain, reduce anxiety, and can even help in improving deep sleep. High blood pressure (hypertension) is a major cause of heart attacks, strokes and chronic kidney disease. In several studies, a higher protein intake has been shown to lower blood pressure. It has also been shown that a high-protein diet can lower your “bad” cholesterol – LDL, and triglycerides, which is a type of fat in your blood. As you age your muscles shrink. This is called age-relate sarcopenia, and is one of the main causes of frailty, bone fractures, and reduced quality of life in old age. One of the main reasons that muscles decreases while fat builds up as you age is due to the body’s inability to create amino acids; consuming higher protein diet helps the body obtain these amino acids. Overall eating more protein is one of the best ways to prevent age-related sarcopenia.